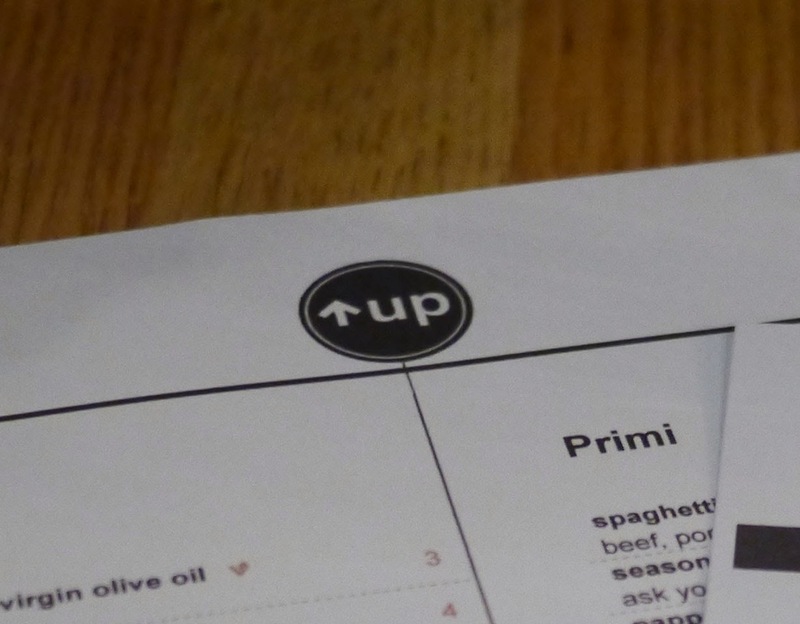 As usual, the winter Pittsburgh Restaurant Week came and went with us only being able to make it to one restaurant: Up Modern Kitchen in Shadyside on Saturday evening. We looked over the regular menu in addition to the special Restaurant Week menu and while there were some yummy sounding dishes not on the special menu, we both decided to go with the 3 course fixed price Restaurant Week menu. And, of course, share with each other. We also each paired a wine with our meal. I chose the prosecco for with the first course, SP chose the Malbec for with the second course. In addition to the wine pairings, we ordered fresh brewed iced teas. We both really enjoyed this creamy, earthy Mushrooms & Toast appetizer. Lots of mushrooms, terrific creamy marsala flavor, So good - my only complaint is that I could have used one more slice of toast to mop up all the creamy, mushroomy sauce. Arugula Salad with poached pears, candied walnut, gorgonzola, and champagne vinaigrette. I find myself enjoying nuts, particularly candied nuts, in my salad more and more these days. I also find myself enjoying fruit in my salad more and more these days, something I previously did not like. This salad was delicious, fresh and crisp arugula, not too much dressing, juicy poached pear slices, tiny bits of walnut. For his entree, SP chose Herb Roasted Chicken with soft polenta, seared mushrooms, and kale. I had a bite of polenta and chicken - the polenta was soft and creamy while the chicken was juicy. SP liked the dish a lot but he really liked the polenta and kale components of the dish. He did find some garlic on the plate, so if we returned, I would not order the chicken. It was definitely a very generous portion. I chose Seared Scallops with celeriac-cauliflower puree, pancetta, watercress, and citrus segments. The scallops were nicely cooked. I really like the combination of citrus and scallops and of course pancetta is always welcome in a dish. It was just the right size for me, but someone with a larger appetite would probably wish for 1-2 more scallops (and perhaps the regular menu scallops dish does have more scallops). For dessert, I chose the Chocolate Cannoli. The chocolate filling was creamy and I liked that the ends of the crisp shell were dipped in chocolate. SP chose Lemon Sorbet. It was very tasty and very lemony - very refreshing and I felt like I was eating a very smooth and rich frozen lemonade. Overall we both enjoyed our dinner at Up. Service was good, friendly, although it seemed after our entrees arrived that our server became a little less attentive. The space is nice inside although since we were seated close to the entrance and since I was facing the wall I didn't get to see very much of it. We would definitely go again and I can see myself ordering the same dishes because they were quite tasty.